All the Baby Moose Pictures? 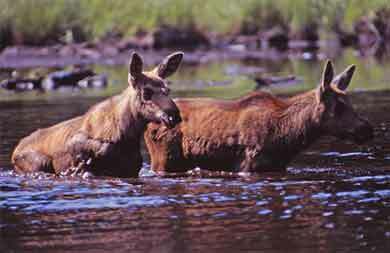 All baby moose (commonly referred to as calves) are born in the spring of the year. 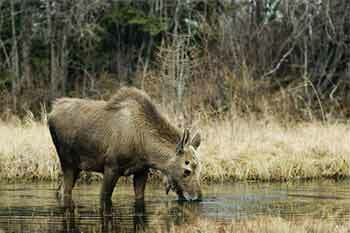 The cows (mother moose) become pregnant in the fall, usually late September or early October. 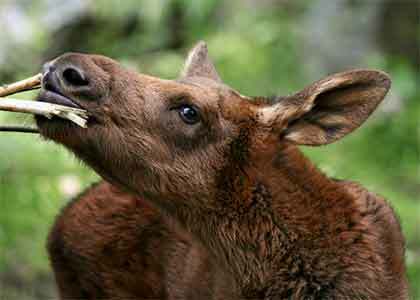 The word moose comes from the Algonquin Eastern Abenaki name moz, which loosely means "twig eater." After only a few days a moose calf is capable of outrunning a human. Moose gain weight at an incredible rate in the first year of life. A calf will gain more than 1 pound a day in the spring and later will have weight gain of over 4 pounds a day. When born calves are dark brown in color, almost black. When moose are born they are completely helpless. 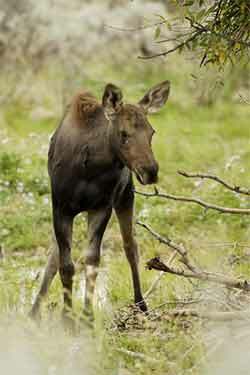 A single born baby moose calf will weight around 30 pounds while twins will weight somewhat less at about 14 pounds. At this time they are completely vulnerable to predators, to protect her calf the cow will keep her calf completely hidden for several days. 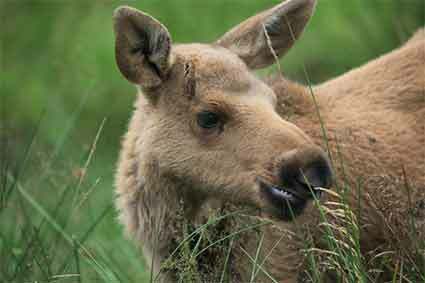 Young moose are born with excellent hearing and sense of smell. 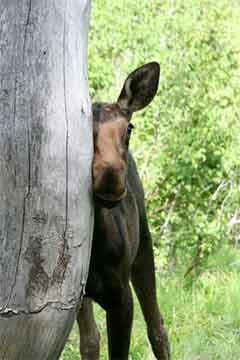 Unfortunately the calf moose has poor eyesight, the same as adults. Do you have awesome Baby-Moose Pictures? 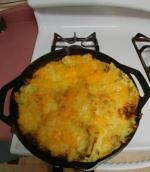 Would you like a chance to share them, and the story that goes along with them. Share your pictures here. 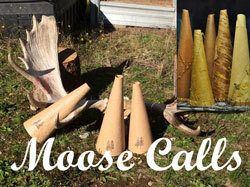 The calf Moose does have a voice. He starts out with a bit of a grunt but within a few days develops a wail that sounds human. Moose calves have several predators to evade during their young lives: Wolves, Cougars, Wolverines, Black Bears, Grizzly Bears and Humans. 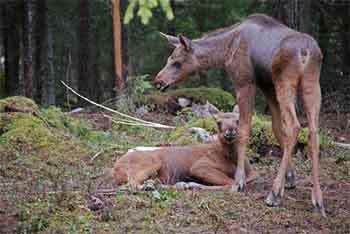 Most moose babies will not survive their first winter. Mother Nature will take the vast majority of them. Only a small percentage ever survive until adulthood. In this close up photo of a moose calf you can see how small his teeth are. 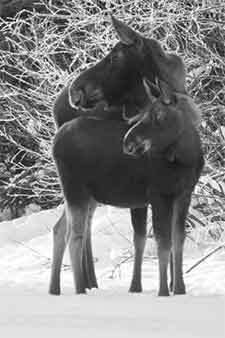 Twin Moose calves in the Boreal Forest. This young moose is living up to its name “Eater of Twigs”. Yearling bulls will often show buttons on their head where their antlers will grow. 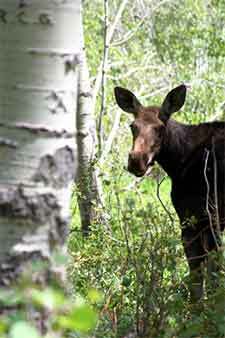 Moose calves are cute and approachable, but they are still wild animals and should always be treated as such. A cow moose defending her calf can be extremely dangerous. Many a curious photographer have been seriously injured by a cow who will vigorously defend and protect her baby moose from danger. Do you have awesome Baby-Moose Pictures? 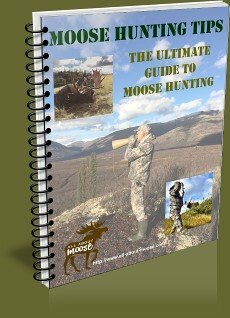 How about trail camera pictures? 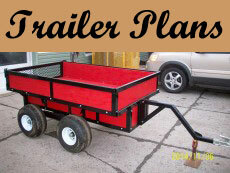 Would you like a chance to share them, and the story that goes along with them. Share your pictures here. 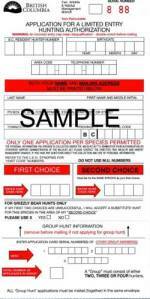 Buy a trail camera, set it up and collect pictures to share. Which is your favorite picture? Leave a comment below!